SUZUKI’S Katana took motorcycle styling to new heights and had everyone from impressionable teenagers to older enthusiasts rushing to Suzuki dealers to see one in the flesh. It was designed in 1980 by Target Design’s Hans Muth, formerly the chief stylist for BMW motorcycles. 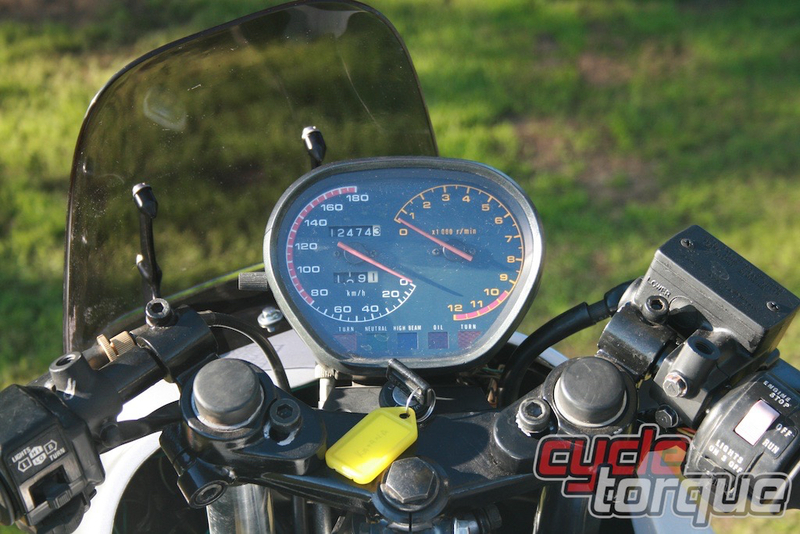 The basic design had already had been used in early 1979 on a one-off MV Agusta but had never made it into production. 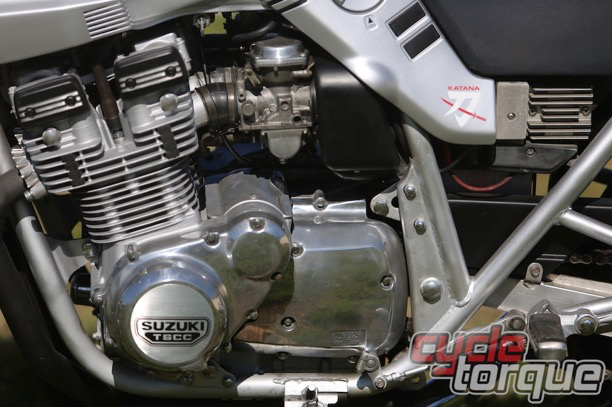 Suzuki was looking to update its sport touring GSX models, which at the time set the standard for performance. The GSX1100 would do 200 km/h in any back street but it didn’t look sporty enough for some people. The GSX1100 frame was slightly modified to suit this futuristic bodywork and the Katana was born. Suzuki called it the GSX1100S and not long after a 750 version, the GSX750S, was released. Both looked the same but there were subtle differences, like an 18 inch rear wheel on the 750 compared to a 17 inch wheel on the 1100. The 750 engine was quick but had a different crank set up to the 1100. Both were reliable though. There was also a very rare 1000cc version built especially for racing. At the time there was a 1000cc limit in Australia for road racing but these 1000cc versions were still road legal. And then you could buy the wire wheel version, the king of the Katanas. It was built especially for racing homologation purposes and sent to South Africa, New Zealand and Australia, with the SA and NZ versions getting a ‘hotter’ engine than the Aussie delivered models. A ‘wire wheel’ Katana is the most sought after and expensive of the range. The 1100 was built up to 1985, basically the same but in different colour schemes along the way. While the 1100 went through with its styling the same, the 750 only lasted a couple of years with the original styling, going more modern. Many older riders would remember the ‘pop up’ headlight 750 Katana. There were also a range of other Katanas, 650, 550, shaft drive and so on, watering down the impact of the original bikes in my opinion. Suzuki also used the Katana name on bikes for many years, mainly in the USA. But while the Katana was futuristic in 1981 by 1984-5 things had changed. You had the Kawasaki GPZ900, Yamaha FZ750, Honda VF1000R, Yamaha RZ500, and Suzuki’s own GSX-R750. All even more futuristic in their styling, all offering arguably better performance and all water-cooled. Even the Europeans were in on the act although the best they could really offer were air-cooled V-twins of questionable reliability and performance, compared to the Japanese bikes mentioned. Today the Katana is almost a Unicorn sort of machine. There’s a few around at varying prices, from around five to 20 grand, depending on the model and condition. Most people want the 1100 version because back in the early ’80s that was THE bike to have. But these days most aren’t prepared to pay the price to own such an icon of motorcycling. The 1983 Katana GSX750S you see here is a Japanese import. It’s much the same as an Australian version except for the 16 inch front wheel. It has been restored to a degree with new paint, rebuilt forks etc and is in very good condition. Katanas of this quality are not thick on the ground that’s for sure. Classic Gas Motorcycles at Boolaroo near Newcastle have this one on the floor for $6,900. You can find out more at www.classicalgasmotorcycles.com. Riding it is like going back in time. 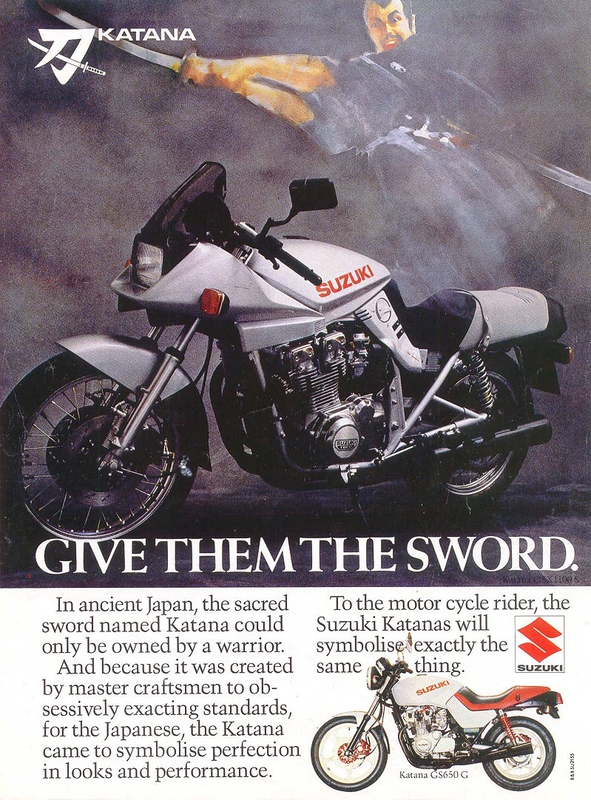 Suzukis have always had a reputation for reliability and this bike, with low kilometres, rides well. You have to remember that although the styling was very modern for its time, the engineering was still rooted in the 1970s, with twin shocks, basic forks and that air-cooled, but powerful, engine. Classic bikes are not usually bought for their on-road performance, they are bought for the memories they evoke and the fun that brings. Some of that is true of a Katana like this one, they do bring back those memories of riding with mates when you had no responsibilities, of happy times and ridiculous performance. That’s what this bike did for me. I remember seeing them when they were new and thought it was amazing. When I rode one for the first time as a 21-year-old I thought I was riding the Space Shuttle. I wound the throttle on to overtake a car and the power was simply astonishing, especially for that time. I owned one a few years later and loved it. 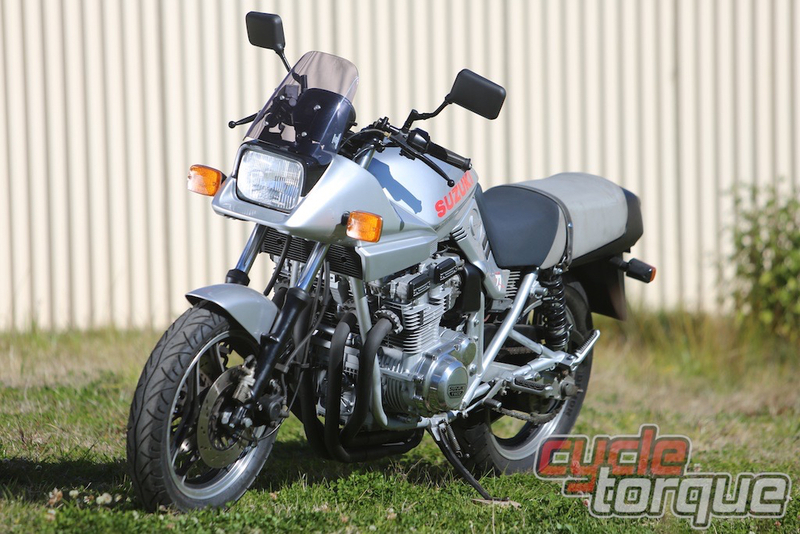 The Katana is a bike that’s been much modified over the years too, with many owners fitting more modern wheels and suspension, substantially improving the rideability of the bike. This includes machines currently dominating classic racing in Australia. The toughness of the original engines has allowed tuners to get massive horsepower out of them, and riders doing lap times not far off modern racing motorcycles. The road going Katana is still a nice bike to ride, and you will stand out like a sore thumb when on it. People will gawk and the people who know what it is will nod their head and remember back to when the Katana ruled the streets.